Omega Constellation, the legend is still alive! It tells the time. And a few things more. by Robert Jan Broer, Voorburg / Netherlands 6th of Februari 2001. This article is a review on my grandfathers wristwatch, which is currently at my house because it needs to be cleaned/serviced. This article starts with some general information and history about the Constellation line from Omega SA. My grandfather is first owner of it and he bought it in 1968 at Kwekkeboom in Enschede (Netherlands) when they were an Omega dealer. He also bought a ladies automatic watch for my grandmother, I think it is a Ladymatic. My greatgrandfather bought a 1965 Omega Constellation (goldcapped) with a cal.551 movement and that one is now on the wrist of my father. That one is a pie-pan model, which was and still is one of the most desired Constellations since 1952. Omega, the famous watchcompany from Biel, always attended the Observatory-contests which were hold at several places. A total of 93 victories, whereof 72 are real records. A few big names of precisionregulators from Omega are : Alfred Jaccard, Albert Willemin, Werner Dubois, Carl Billeter, Joseph Ory and André Brielmann. Omega decided that it would be important to produce a serie of wristwatches that had the chronometer certificate. So Omega introduced the first chronometer wristwatch in 1939, called "30mm". Omega produced a lot of chronometer wristwatches, the 100.000th chronometer timekeeper was produced in 1946. In 1952, Omega introduced the Constellation. A watch that later on became the flagship of Omega and still is. On your right you see the first Constellation. The first Constellations (till late 60s) were also reffered to as 'pie-pans' because the dial has the same shape as a upside down pie-pan. It used the 28.10RA movement a.k.a the cal.354 movement. On your left you'll see the cal.354 movement as used in those first Constellations. Later on, Omega started using the cal.5xx movements like the 501, 505 and after that the 551, 561(date) and 564 (quickset date). In 1958 the Constellation Chronometer had a higher number of watches produced and sold than the Rolex Oyster-Perpetual Chronometer. This lasted until 1969 (194.580 Omega Chronometers vs 179.169 Rolex Chronometers), then Omega lost track and maybe this was also part of the Quartz-revolution/crisis. Omega still isn't back at the spot it once was, but imo they are on their way (with the 18kt WG Speedmaster Moonphase, Co-Axial and tourbillon). Back in the '50s and '60s, Omega had the same status (or even better) than Rolex. Rolex had a different status/image back then they have now. It was a fine Swiss watch which was innovative and affordable (relatively spoken). The Constellation serie was one of the most accurate watches around and came in different flavors. The Constellation is already 48 years in the collection of Omega, and it probably will stay there for the rest of Omegas lifetime. Omega is not complete without this watchline. The current models (as can be seen elsewhere in this document) are available with automatic and quartz movements. The current automatic movement is an ETA 2892-A2 based movement (Omega cal.1120) and is chronometer certified. One of the nicer modified ETA 2892-A2 movements around in my opinion. The cal.354 on the left is not a chronometer grade movement. Constellations also used the cal.352 movement, which was the deluxe excution of the chronometer graded movement. The movements in the Constellations in the period of 1952-1970 were all in-house. After that they started using the electronic movements from Bulova/ESA (now ETA) and the Lemania automatic movements. So if you want a watch with an in-house movement, check those vintage beauties. In the early 70s they also used the 75x movements, which are also in-house. The movement on the right is a cal. 561. This movement was used a lot in the Constellations with a date-window. 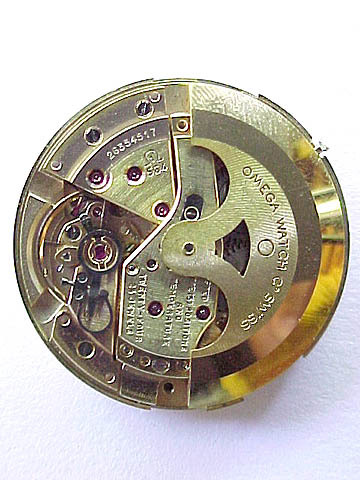 It is based on the cal.550 movement that was introduced in 1959. It ticks at 19.800 bph, has 24 jewels and is (ofcourse) chronometer certified. This movements lacks a quickset feature, you have to search for a Constellation with a cal.564 movement for this option. Vintage Constellations are very wanted. Prices are going up as we speak and still, these vintage beauties aren't very hard to find. They can be found at most online watchstores, regular watchstores (occasions) and watchfairs. Prices for steel models (depending on condition of the watch) from the mid-60s (with a cal.551 or 56x) are starting at about 300 USD. The prices for gold-capped or even solid gold models are higher. Also the ones with gold bracelets are more expensive. The bracelets for these watches are hard to get. They are known to break or fail and most of them were replaced by aftermarket bracelets or a leather strap one time. You can also take a look at one of the various auction websites like eBay, Henrys(.de) and Ricardo . My grandfather bought the watch in 1968 at a local jeweler in Enschede called Kwekkeboom. Kwekkeboom is still situated in the shoppingcentre of Enschede and sells Tag Heuer, IWC, Zenith, Ebel and a lot of jewels. They don't have Omega in their collection anymore, the reason is unknown, but I am quite glad that they don't sell it anymore. The salespeople don't know much about the watches they are selling, like most jewelers in general. My grandfather stills owns all papers that came with it (including the chronometerwarranty) and the red box. Omega was a brand that was just as well known as Rolex is now. A good Swiss watch that was available starting at very affordable prices (Omega Geneve line) and ended in 18kt gold watches with fabulous mechanic movements (Omega Constellation/Seamaster Deluxe). I can't say much about the reasons why they bought it, I guess they just wanted to have a good watch. As you can see on the picture above, the bracelet is aftermarket. It is 14kt solid gold, and feels very comfortable (I need some extra links (which my grandfather still has somewhere in a drawer) to make it fit for me personally) but it looks a bit too gaudy on my wrist (I am 23 ;-)). He replaced the original bracelet because the sides of it got rough and ripped all his shirts. He traded in his original bracelet for this one, a much nicer one imo. I don't like the milanese style bracelets at all. The clasp is not a safety buckle as can be seen above, but it will do (you have to make sure that the bracelet isn't too tight so it won't flip open by accident). The watch has an height of ca. 1 cm, and has a plastic crystal. I think it is an aftermarket crystal, because I had it replaced 2 years ago when it had a crack in it. It could be original, but I can't see any signs that it is. The crown is original, but shows signs of wear, I think it is some sort of doublé or plated gold. I think I will try to look for a 8 sided original massive gold crown, like the one on a pie-pan model. As you can see, this watch is a goldcapped model. It has the 14kt 585 sign (a leaf of an oak?) in one of the lugs and in the bracelet. Gold less than 14kt was not 'official' here in the Netherlands. So 8kt (333) and 10kt (?) wasn't used here on Omega watches. The caseback is a 'screw'-type and it has the gold observatorium that all Constellations have (except for some models, including the electronics?). The observatorium on these watches is much nicer (because it is more 'bold') than the ones on the current line of Constellations imo (I have one). You can also see that the lugs are stainless steel on the inside/back of the watch. I don't have pictures of the movement, but when I opened it up this evening, it has a gasketring on the caseback. The gasketring has to be replaced once in a while to make it dust and (a bit) waterresistant. 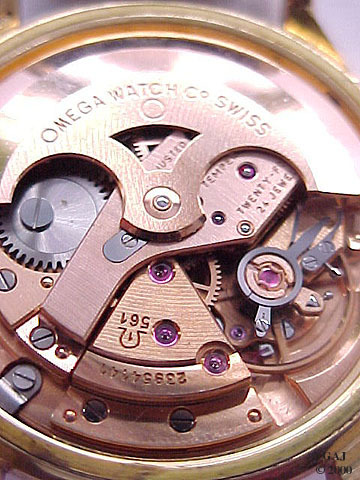 The movement that ticks inside is a cal.564, which is an inhouse movement of Omega that was based on cal.551 (since 1959). It has 24 jewels, a date (quickset) and is chronometer certified. When you pull the crown once, you can set the time. When you pull it again (from position 1), it will automatically increase the date. The datechange begins at 22:00 and ends at 0:00. I can't test the accuracy of the watch since it has to be serviced, but I think it will run fine once the job is done. I will update this article with a accuracy-test. Above you see a similar movement. The serialnumber on my grandfather's watch is starting with 25728xxx. So I guess it was made in 1967 (according to my own time/productiontable that I have made a while ago). The ref.type is 168.010. 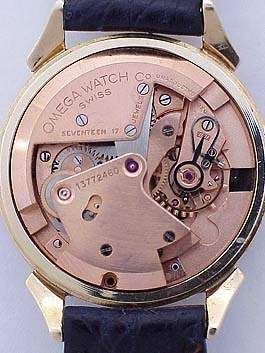 The '1' in the Omega symbol means that it is a revised version of the movement. The dial has a sort of 'champagne' color and is a bit damaged at some points. I heard that my grandfather forgot to take his watch off when washing hands or while doing the dishes and that the watch/dial catched some water. I don't think it can be restored without doing damage to its originality. The raised Omega symbol and word are gold and so are the markers, hands and the square around the datewindow. The glass scratches quite easily, but these tiny scratches can be removed with Polywatch or brasso. The tritium is almost gone and it doesn't luminate at all at night or in the dark. The hands also lost a bit of tritium through the years. It can be restored, but here goes the same as with restoration of the dial. Perfection or originality? Me, wearing my grandfathers Constellation. Although the bracelet is a bit too tight for me, I think it is a hell of a dresswatch. The size is perfect, not too small and certainly not too big. Normally I am used wearing a Speedmaster Professional or a Seamaster Professional but I was used to this size within a blink of the eye. Again, for me personally, I would prefer a brown leather crocograin strap over a gold bracelet. My new Constellation however, has a gold/steel combination bracelet which suits me fine. One of the next watches in my modest collection will be a vintage Constellation, and I think I have to be quick because prices are going up fast. I saw this trend again on the last watchfair in Houten (near Utrecht, The Netherlands). Omega always saw their Constellation as the flagship of their collection, and I think the vintage Constellations ranging from 1952-1969 certainly are. They still will do perfectly as a dresswatch, and much more affordable than a Rolex Date for example. I don't think there is much difference between these two brands of the same age, although I can't proof this because my knowledge of Rolex is too little. You can find the Omega Constellation pie-pan models with cal.551 or cal.561/564 (date) starting at very decent prices on the auction websites. The cal.55x and 56x movements are very common and can be replaced or being repared without any major problems I guess. I hope you enjoyed this review and please visit my site about Omega wristwatches also, it is located at : http://www.omega-addict.com/ . If you have any comments on this article or if you have any questions about this watch or other Omega models, don't hestitate to contact me. My emailaddress is on top of the page. p.s. All pictures of the reviewed Constellation were made by me, with a Sony Mavica FD-85. And thanks to Bill Sohne on some corrections.